Our landlord insurance policies are arranged through all major and well known UK insurers as well as Lloyds of London to provide our customers with a tailor-made, comprehensive policy that suits the individual. Our quote form is simple and easy to use. In just a few quick steps you can build the policy that suits your needs and choose from up to 6 landlord insurance quotes from our major insurers. See how much time and money you can save on your landlord insurance quotes today! What are the features of Landlord Insurance? Why do I need Landlord Insurance? Landlord insurance will protect you, your property and your tenants in case of any accident, injury or damage to property. Normal home insurance policies do not usually cover rental activities, as this is a commercial endeavour and presents a different set of risks. Although it is not a legal requirement to take out a landlord insurance policy, failure to do so could end up costing you a fortune in the long run. For example, damage caused by a leaky pipe which your tenants fail to report will cost more to fix than a monthly landlord insurance policy! Or perhaps a worker slips on a spillage in a warehouse which you own, the legal costs of facing a compensation claim can easily run into the thousands but commercial property insurance & landlord liability insurance can cover you for this. Even if you own an unoccupied property, it can be an attractive target for vandals and thieves and it is a good idea to consider an unoccupied property insurance policy. Full-time landlords rely on the rent from their tenants as income. If your property becomes uninhabitable, it means your rent will cease while work is being undertaken to restore your property to a liveable standard again. Loss of income cover is available as part of your landlord insurance policy, and with some building repairs and renovations taking months, this could protect you against losing thousands of pounds in potential rent. 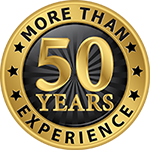 We have over 50 years’ experience working in the landlord insurance industry. With the help of our team of experts, we will work with you to compare landlord insurance policies to find the right one for your specific needs.We will also be happy to answer any questions you may have. Get in touch with us today for a free landlord insurance quote! If you find a cheaper quote for an equivalent policy (providing written proof within two days of purchase), you may cancel and receive a full refund subject to no claims being made. Landlords waiting more than five months to regain their property.